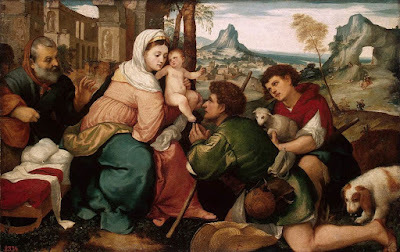 Adoration of the Shepherds, Bonifacio Veronese, shamelessly pinched from here. I love St. Joseph's face in this one...and the little dog. God is so great that he can become small. God is so powerful that he can make himself vulnerable and come to us as a defenceless child, so that we can love him. God is so good that he can give up his divine splendour and come down to a stable, so that we might find him, so that his goodness might touch us, give itself to us and continue to work through us. This is Christmas: "You are my son, this day I have begotten you". God has become one of us, so that we can be with him and become like him. As a sign, he chose the Child lying in the manger: this is how God is. This is how we come to know him. And on every child shines something of the splendour of that "today", of that closeness of God which we ought to love and to which we must yield – it shines on every child, even on those still unborn.